Urinary incontinence, or bladder leakage, affects up to 30 million American women. We are proud to be the first clinic in Staten Island to offer a new treatment option to our patients suffering from incontinence. The InTone device will help our patients get the most out of their exercise program and regain control of their body. Symptoms of stress incontinence include leakage that occurs after coughing, sneezing, laughing, or during exercise and is often related to weakened pelvic floor muscles. Symptoms of urge incontinence include a strong, sudden need to urinate due to bladder spasms or contractions. After prescribing InTone Katarzyna Niebrzydowska, PT, DPT, MTC, CFC, CKTP, customizes the settings for InTone and the patient is shown how to use it at home. A sensor in the unit measures the strength of the patient’s contraction while visual biofeedback is provided to further encourage the patient’s performance. The hand-held control unit uses voice-guided instruction to guide the patient through the exercise routine, reminding her to maintain relaxation of her abdomen, buttocks and leg muscles. Each daily session takes about ten minutes, and data from each session is recorded. After two weeks, the patient follows up Katarzyna Niebrzydowska, PT, DPT, MTC, CFC, CKTP, who will analyze her recorded data and modifies InTone settings based upon the patient’s progress. Patients will continue to follow up once per month for a duration of 14-26 weeks, based upon her diagnosis. A Guaranteed Solution: Many women with urinary incontinence endure it in silence. Pads and hygiene products do nothing to treat the condition. Medications, if prescribed, can cause side effects and are not always effective. Surgery, if performed, can be expensive and painful, and is not a guaranteed solution. InTone is the only treatment option that provides the patient with a full money-back guarantee on the cost of the device if she does not experience improvement after following the recommended protocol. InTone is now available by prescription to patients in the United States. More information on InTone can be found at http://www.incontrolmedical.com. InTone was developed by InControl Medical, LLC, an FDA-listed company based in Brookfield, Wisconsin providing specialty medical products for women’s health, and is sourced and manufactured entirely in the United States. 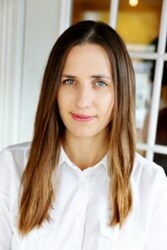 To contact Katarzyna Niebrzydowska, PT, DPT, MTC, CFC, CKTP, please call (917) 453-2060.